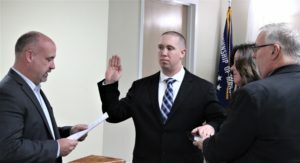 The Manchester Township Police Department is pleased to welcome two new officers, Patrolman Michael Gardner and Special Law Enforcement Officer II (SLEO II) Kevin Rembach, who were sworn in by Mayor Kenneth T. Palmer during a ceremony in the Municipal Complex Civic Center on January 14, 2019, in front of family, police personnel and Township administrators. Additionally, SLEO II Robert Campolei, who joined the department last September and has excelled in that role, was hired as a full-time Patrolman. 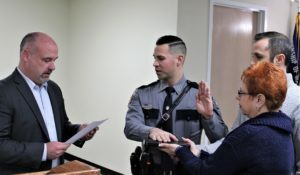 First to be sworn in was Robert Campolei, a 32-year-old Lacey resident. Ptl. Campolei, a graduate of Ocean County College began his law enforcement career in 2015 as a SLEO I with the Seaside Heights Police Department. After graduating from the Ocean County Police Academy, Ptl. Campolei worked as a SLEO II for Seaside Heights and later Lacey Township. During the ceremony, Chief Lisa Parker noted that Ptl. Campolei performed exemplary during his Field Training and Evaluation Program as a SLEO II. 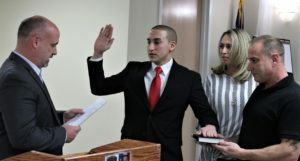 Second to be sworn in was Michael Gardner, a 23-year-old resident of Toms River. As a graduate of Toms River High School North, Ptl. Gardner went on to receive his Criminal Justice degree from Stockton University and previously worked for the Seaside Heights Police Department. He graduated eighth in his class from the Ocean County Police Academy in May of 2018. Last to take the oath of office was 27-year-old Kevin Rembach, a lifelong resident of Manchester Township. SLEO II Rembach, who is an Eagle Scout, attended Ocean County College, Richard Stockton University, and is currently completing his degree in Public Administration at Fairleigh Dickinson University. SLEO II Rembach previously worked for the Seaside Park Police Department and graduated from the Ocean County Police Academy in May of 2016. The swearing in ceremony was led by Chief Parker, who explained that the intensive Manchester Township Police Department hiring process began in January of 2018, when approximately 170 individuals submitted their applications for employment. For the first phase, applicants participated in the Physical Agility Examination held at Manchester Township High School. This grueling test consisted of pull-ups, push-ups, sit-ups, squat thrusts, and a 1 mile run. Those applicants who achieved a passing score advanced to the boxing component. The 92 applicants who completed all portions of the physical exam were invited to participate in the Written Examination phase. From there, the top scorers went before the Oral Board for extensive interviews. Those candidates considered for employment underwent a thorough background investigation and submitted to medical, psychological, and drug screenings. These officers were hired in response to recent and anticipated retirements within the department. Ptl. Gardner and SLEO II Rembach now will begin the Manchester Township Police Department’s intensive twelve week Field Training and Evaluation Program. 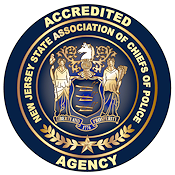 During this training, they will be instructed and mentored by several highly trained and seasoned officers. We wish them both success in their law enforcement careers serving Manchester Township and its residents.